Only a very small minority of people could afford to drink wine during the 19th century, and the working classes in particular enjoyed cheaper drinks such beer and gin. 1876 saw a new peak in the consumption of alcohol in Britain, stemming from the Single Bottle Act, which allowed people to buy individual bottles of alcohol rather than wholesale amounts. Opening hours in London pubs ran from 5am until well past midnight. 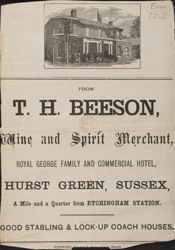 From the 1890s on, people started to drink less alcohol and merchants like TH Beeson would stock only the most popular drinks.